Indian Head Massage New Zealand offer training through their School and treatments in this ancient massage technique based on the Indian Ayurvedic healing system. The training workshops taught by Xanthe Ashton are in response to requests from the public wanting to learn this ancient and beautiful massage technique. Xanthe has been practicing and teaching across New Zealand since 2003. Indian Head Massage has its roots deep within Indian culture. It was originally practiced by Indian women as part of daily family grooming and as a means of bonding with their family. As such, it was passed down the generations from mother to daughter. Indian Head Massage is often seen practiced by Indian barbers as part of a visit to the barber. It can also be seen being practiced on the beaches in some areas of India. 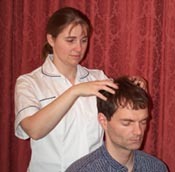 Indian Head Massage was brought to the West by Narendra Mehta, who, on moving to England, missed his regular massage treatments and set about teaching his form of Indian Head Massage, refining the techniques and routines into a standardized form. He began teaching in London, but his work is quickly spreading worldwide. Courses are only being scheduled in Christchurch but if you would like one to be offered in your area and can get a group of 10 or more people together please contact us.